Enlightened Solutions Ltd. - Paleo Nutrition - Designed By Nature. What Is Paleo & Ancestral Nutrition?? Preheat oven to 400°F. Line a baking sheet with aluminum foil. Slice bell peppers in half lengthwise and remove ribs and seeds. Place pepper halves on baking sheet and bake for 20 minutes on the middle rack. Remove peppers from oven, and fill each pepper with ¼ cup basic savory meat sauce. Add 2 Tbsp. of ricotta cheese on top of the meat sauce in each pepper half. Add an additional spoonful of meat sauce on top of the ricotta. Top each pepper with 2 Tbsp. mozzarella cheese, parmesan and Italian seasoning. Bake on middle rack for 12 minutes until the cheese is bubbling and brown. Preheat oven to 400. Slice spaghetti squash length wise and scrape out the seeds. Rub 1/4 tbsp olive oil into each squash half and season with salt and pepper. 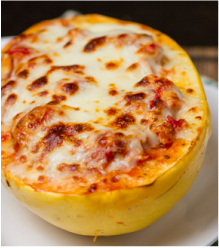 Place each spaghetti squash half face down in a large baking dish and bake for 40-60 min. When squash is done, middle will be tender and pull apart easily. In a large pan, prepare meat sauce as per recipe (link provided above). Meanwhile, combine ricotta and cottage cheese in a medium bowl. Season with 1 teaspoon each basil and oregano. Add a pinch each of salt and pepper. Lightly mix until combined. When spaghetti squash is fully cooked, turn over and divide ricotta mixture between each squash half. Repeat with meat sauce. Top each half with 1/4 cup mozzarella cheese. Turn oven to broil, and cook for an other 3 minutes, until cheese is browned and bubbling. Make sure to watch closely, otherwise it can burn easily. Serve immediately. OR... make ahead and re-heat in a 375 degree oven for 35 minutes. Put under the broiler for 3 minutes to brown the cheese. In a small bowl, stir together paprika, black pepper, onion powder, thyme, rosemary, garlic powder, and cayenne pepper. Cube the sweet potatoes and put them in a large ziplock plastic bag. Add the olive oil, and roll the potatoes around to coat. Dump the coated sweet potatoes into the seasons and mix to coat well. Bake in preheated oven until tender, or about 1 hour. Have you ever wondered about that "put the lime in the coconut" song? Remove the woody end of each asparagus stalk (usually the bottom 1 1/2 inches). Peel off the outer layer of the bottom third of each stalk (this allows the marinade to seep in more effectively). Toss asparagus with lime juice, salt and pepper, and let marinate for 30 minutes to an hour. To Grill: Preheat grill to high heat. Turn asparagus every few minutes to ensure even browning, and grill until charred and barely fork tender, about 5 to 10 minutes (depending on thickness of the spears). To Roast in Oven: Preheat oven to 400F. Spread asparagus in a single layer across a baking sheet. Roast until barely browned and fork tender, about 7 to 10 minutes or a bit longer depending on the thickness of the spears. Fill a small pot with an inch of water. Bring to a boil over high heat, then reduce heat to low and simmer. Or, use a double boiler if you have one. Meanwhile, in a medium heatproof bowl, whisk egg yolks until thick and creamy. Stir in the lime juice and grated ginger, and place bowl over the pot of simmering water, or in the top of your double boiler if you are using one. Continue to stir until bottom of bowl is visible when you stir, which indicates that egg yolks have begun to cook. Slowly whisk in the coconut milk and melted coconut oil. Taste, and add salt and pepper as desired. Do ahead: can be prepared up to 3 days in advance and stored in airtight, refrigerated container. Bring to room temperature or heat slightly in microwave before serving. Latkes are essentially potato pancakes, which are associated with cuisines of many European and Middle Eastern century-old traditions. This twist on the old classic is a great way to get your veggies in, or encourage confirmed veggie haters to eat more veggies. * If you are afraid to use these oils, then you need to read our "Fats" page, which can be found under the "Paleo Fundamentals" menu. After grating veggies, wrap them in a thin towel to squeeze out excess moisture. 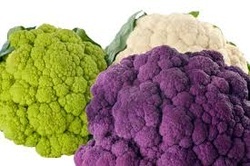 Combine with the garlic, eggs and seasonings. In a large skillet, heat the oil, using enough to have a thick coating in the pan. Place about 2 TBSP of the mixture in the oil and flatten with the back of a spoon. Add as many latkes to the pan as you can without overcrowding. Fry for about 3 minutes or until golden brown. Flip and fry the other side. Delicious with sour cream if you are eating dairy products. Lightly spray a baking pan with cooking spray and add the mixture. You want it to be about 1/2 inch thick so that it crisps up. Top with more mozzarella or parmesan cheese and bake another 5 minutes. Heat oil and butter in large sauté pan or skillet over medium-high heat. Add garlic and season with salt and pepper. Cook garlic for about 1 minute - do not allow it to brown. Add the asparagus and toss to coat. Reduce the heat to medium, cover and cook for 8-10 minutes, or until the asparagus is tender, but still slightly firm. Turn for even cooking. ... and now for something completely different! If you are trying to expand your food horizons, I strongly suggest this recipe. Blanch 1 bunch of kale for 4-5 min in large pot of boiling, salted water. Transfer to colander; drain. Keep blanching water boiling. 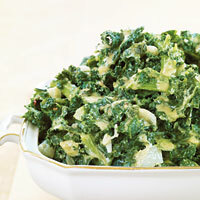 Gently squeeze excess water from cooked kale; set aside. Repeat with second bunch of kale. Set kale aside. Add oil and onions to braising pan on MEDIUM. Cook, stirring occasionally, 5-7 min until soft, but not browned. Add garlic, crushed red pepper, and 1/4 tsp salt. Cook, stirring, 1 min. Stir in coconut milk. Bring to boil on MEDIUM-HIGH. Cook, stirring, 4-5 min until thickened. Remove from heat. Add kale to coconut milk mixture. Cook on MEDIUM about 5 min, until kale is tender. Season to taste with salt and pepper. This recipe comes from the master herself - Julia Child. One of the national emblems of Wales, along with the daffodil, leeks contain many noteworthy flavonoid anti-oxidants and are a great source of minerals and vitamins that are essential for optimum health. Their leafy stems contain several vital vitamins such as pyridoxine, folic acid, niacin, riboflavin, and thiamin in healthy proportions. 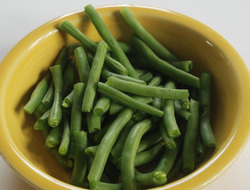 100 g fresh stalks provide 64 µg of folates. If you are just using this mild member of the onion family in soups, you are missing out on a wonderful vegetable side dish. Moreover, leeks are readily available all year. Trim the root end of the leeks, being careful to keep leaves attached. Trim top of leaves so that leeks are 6 to 7 inches long. Slit each leek lengthwise down to where the white begins; give the leeks a quarter turn and slit again. (If leeks are extremely fat, simply cut them in half lengthwise). Wash thoroughly under clod water, spreading each leaf apart to rinse off all dirt and grit. Place leeks in a buttered baking dish. Pour broth over leeks to cover them halfway. Salt and pepper to taste; dot with butter. Cover and bake 30 to 40 minutes. Allow to cool slightly, basting with the liquid. Remove leeks to a serving platter and pour remaining juices into saucepan. Rapidly boil down the juices until almost syrupy. Taste for salt and pepper, adjust, then swirl in 2 to 3 tablespoons of butter. Spoon over leeks and serve. Preheat the oven to 450°F with the rack in the middle of the oven. Line a baking sheet with aluminum foil. In a bowl or bag, combine beans and all ingredients except the lemon/lime juice. Shake your beans in the sauce, then arrange on a single layer on your foil lined baking sheet. Bake for 20 minutes, tossing the beans at the 10 minute mark. When the skins are wrinkly and dotted with browned spots, they are done. Squeeze on the lemon or lime juice and serve immediately.